Cosmological Simulations of Multicomponent Cold Dark Matter, M. V. Medvedev, Physical Review Letters, 113, 071303, 2014. Abstract, with link to full article. On the Dynamics of Non-Relativistic Flavor-Mixed Particles, M. V. Medvedev, Journal of Cosmology and Astroparticle Physics, 06, 063, 2014. Abstract, with link to full article. Evaporation of a Flavor-Mixed Particle from a Gravitational Potential, M. V. Medvedev, Journal of Physics A: Mathematical and Theoretical, 43, 372002, 2010. Abstract, with link to full article. 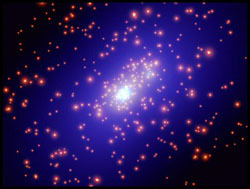 Can Cluster Evaporation Explain the Missing Thermal Energy in Galaxy Clusters?, M. V. Medvedev, Astrophysical Journal Letters, 662, L11, 2007. Abstract, with link to full article. Cluster Magnetic Fields from Large-Scale-Structure and Galaxy Shocks, M. V. Medvedev, L. O. Silva, and M. Kamionkowski, Astrophysical Journal Letters, 642, L1, 2006. Abstract, with link to full article. Thermal Conduction in Clusters of Galaxies, R. Narayan and M. V. Medvedev, Astrophysical Journal Letters, 562, L129, 2001. Abstract, with link to full article.